A film by It Drew Itself for the forthcoming Lick Your Own Wounds, the new solo show from I-LIB at No Walls Gallery, Brighton set to open Friday, 27 April 2012. 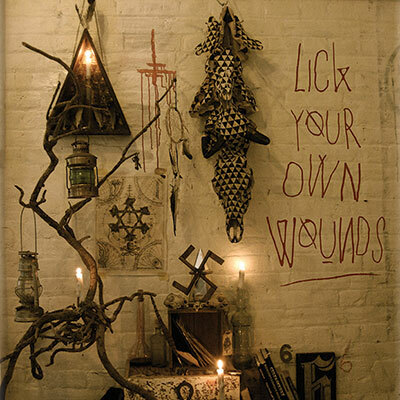 Lick Your Own Wounds will depict a series of visually strange, philosophical and folkloric imagery, intertwining occult symbolism, black magic, shamanism & voodoo. I-Lib’s sensitive eye translates his subjects into poetic visions with surreal and dreamlike atmospheres of anthropomorphic subjects and mysticism. The wondrous folkloric animals that re-emerge from our childhood memories illustrate fairy tales that are morally crude and disenchanted but who’s mutations grow and twist up out of a time and place long forgotten by this world. From the fine and delicate lines in the drawings and hidden messages and meanings within the complex symbolism, to the mechanical interactive sculptures of bone and installations made of dead lifeless objects all lead us into an extraordinarily life-full poetic world that is surely the soul reason Alice went chasing down the rabbit hole. The detailed body of works has been created using a whole arsenal of inks, oils, spray paint, charcoal, graphite, wax & more, using a combination of diverse mediums from illustrations, paintings and printing to sculptures and installations. Working onto old discarded materials such as wood, metal, bones and paper he morphs the textures, patterns and decay to deliver an enigmatic and haunting set of work. It’s endearing that the materials he works with all had a previous life before their current incarnation is bought to its surface. All welcome on the opening night.... just click I’m Attending on their Facebook event page or email info@nowallsgallery.com to RSVP.